The MG Metro was introduced in May 1982 some 18 months after the pain of the closure of the MG factory at Abingdon. This tainted many MG enthusiasts reception for this car in a negative way as it was somewhat different to the traditional sports car market, although at this time the then new ‘hot hatch’ era heralded by the Golf GTi was in full swing, and as far as manufacturers and most car buyers were concerned open top two seat sports cars were something from the past. Indeed the modest sales expectations for the MG version of the Metro range was expected to be no more than 10%, yet in a short period of time sales were running in excess of 25%. Mainstream MG enthusiast view though remained tainted and the model was unfairly tarred with the ‘badge engineering’ label that was rightly created to describe the BMC saloon ranges of the 1960’s. The reality was that the development and re-engineering that the car was given was significant and it was a model in its own right, with performance and handling to easily beat the recently demised MGB it must be said! However, adding a spoiler, different graphics, wheels and tyres to the outside, with different seats and interior trims inside didn’t change the body shape and it remained a three door Metro, which for the entrenched enthusiast was not enough compensation for the demise of the two seat open top sports MG.
Back to reality though and history shows that the build quality of the cars was quite variable, unfortunately this went from very bad to only acceptable in the first few years and really only after around 1986 were there more consistent and better results. The spec and performance of the cars was generally good and competitive for the day, although even then the limitations of the A series engine mounted on top of the only four speed gearbox (Mini powertrain remember) was seen as a disadvantage to the then common end on 5 speed gearboxes that most competitors had. The MG Metro boasted some quite positive features for the day including the standard use of powerful servo assisted brakes using four pot (piston) calipers up front, very competitive performance and superb economy courtesy of the responsive and well proven A+ series engine. It is often forgotten that in those days the engine were devoid of a great deal of efficiency strangling emission equipment. A mute point here is that whilst not delivering perhaps the required exhaust pipe gas make up of today’s ‘enlightened?’ times, the cars were light in weight and so were able to deliver good performance and economy without having to produce huge power outputs and consequent larger volumes of exhaust gas to do the same as a modern car. Something of a trade off comparing exhaust gas make up against volume, but the point is that these cars were not as dirty and do not contribute as much pollution as many would try and make you believe. One area these cars patently failed to deliver acceptable performance was in their longevity as they rust with the speed that ice melts in summer sun! Allied to the iffy build quality, the poor reception and very low residual values and it is hardly surprising that apart from at Classic Car shows the MG Metro is a rare sight. During the cars production life it was subject to a facelift in October 1984 when the bonnet line was lowered and streamlined and a new interior and dash moulding was introduced. 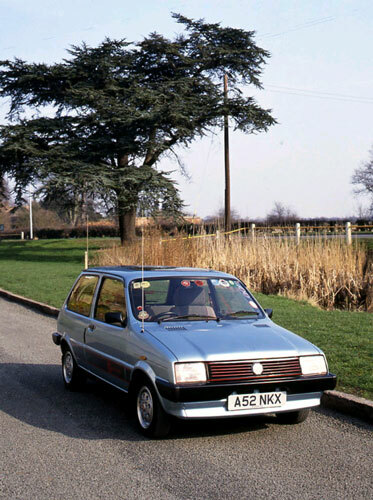 This was a common facelift across the whole Metro range but the MG model retained the stand alone features that allowed it to stand apart from the mainstream Austin and Vanden Plas models. One universal negative change was the adoption of the TD wheel sizes. This used a metric dimension for the wheel diameters and initially only two tyre manufacturers made tyres to these odd sizes, Michelin and Dunlop. The tyres did not perform as well as the traditional imperial sizes and the tyre costs were much more, so the fact many owners changed wheels and tyres to traditional sizes is not surprising. In following years there was some streamlining and cost saving across the whole Metro range with perhaps the most obvious being the moving of alloy wheels to the extra cost option list and replacing with steel wheels with a full size plastic hubcap. As these hubcaps were of a reasonable style and quality this was not as retrograde a step as may first appear. What was seen as a very negative move was in the 1989 model year changes where external styling saw the introduction of large split Octagons and the MG logo down the sides of the cars. This aside the cars were generally quite well screwed together and made for reliable, if now outdated and outperformed small sporting hatchbacks. Remember that Ford Fiesta XR2 and Peugeot 205 GTi were the mainstream and both would run performance rings around the MG Metro. Indeed the base 1.4 litre Fiesta and 1.4 litre 205 would beat the MG Metro. Therefore it is with little surprise that the A series Metro was replaced in 1990 by the Rover Metro with the advanced K series engine and end on 5 speed gearbox. Now though the Rover management had decided the MG badge was for genuine sports cars only and already plans and actions were afoot to provide such cars. Thus the performance Rover Metros were to be the GTa and GTi models.